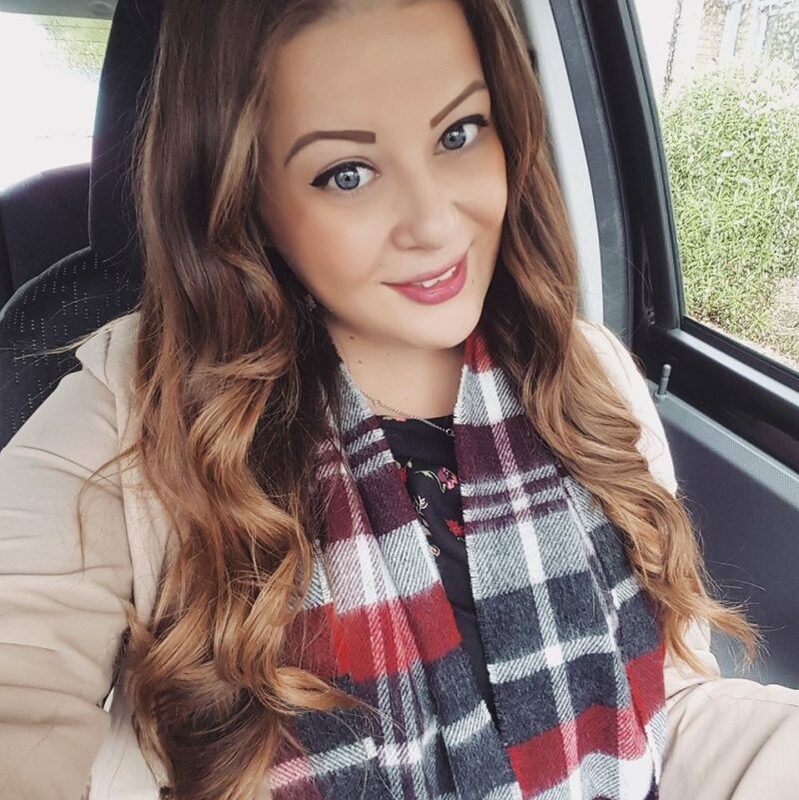 I had a few days off last week before starting my new job, so on Friday we went to Stratford Upon Avon for a little day out. 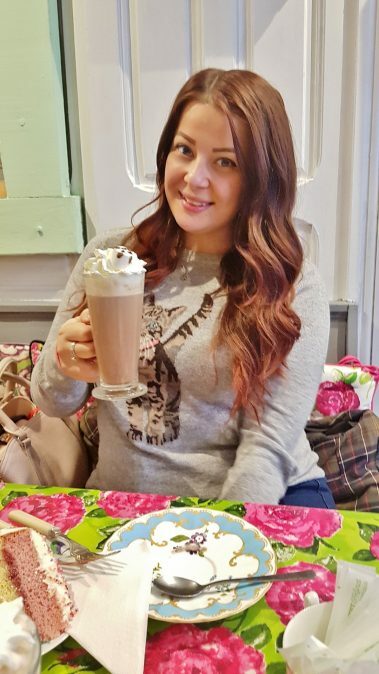 I’d seen on Twitter that a new cat cafe called Shakespaw Cat Cafe opened its doors in Stratford Upon Avon last month, so I was desperate to visit! You have to book online in advance, but I was lucky to grab a lunchtime spot the day before we were due to visit. Entry is £5 each which you pay when you book, and this allows you 90 minutes in the cafe with all their gorgeous cats! 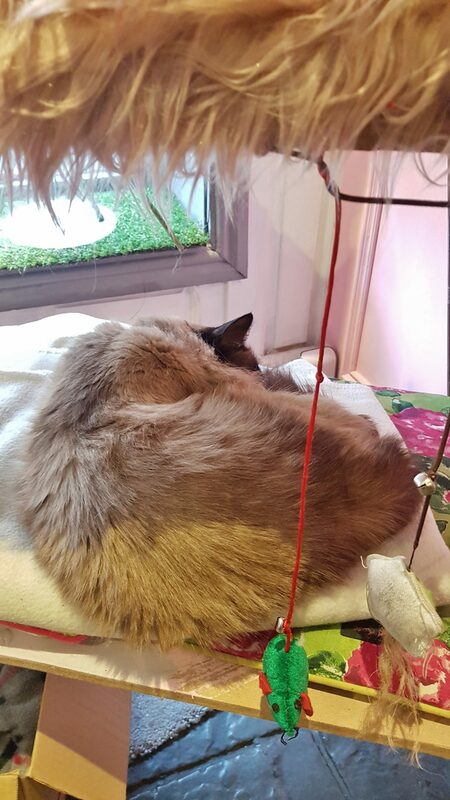 The concept of the cat cafe originates from Taiwan and is very popular in Japan. 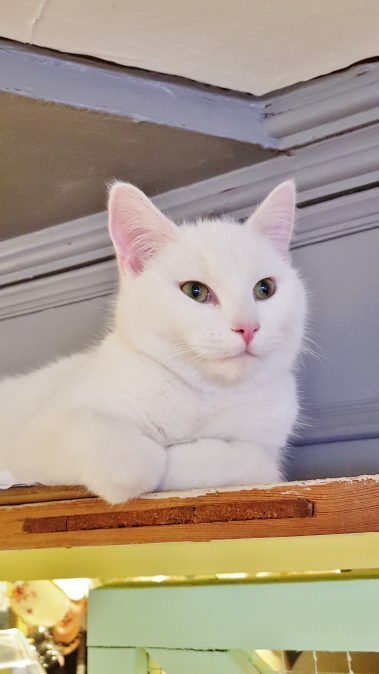 Cat cafes are great for people who are unable to keep their own pets or may not want the responsibility. They’re also great for crazy cat ladies like me! 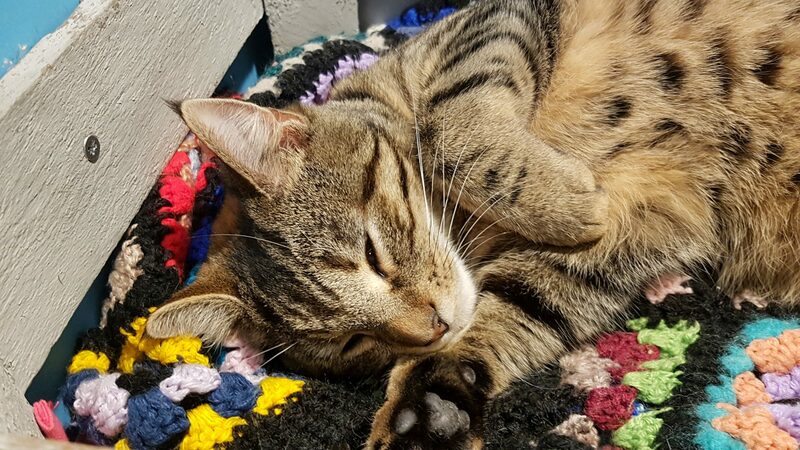 A cat cafe is relaxed place where you can enjoy a hot drink and cake whilst surrounded by beautiful cats who may want to be sociable and interact with visitors, or may just want to have a snooze on your chair! 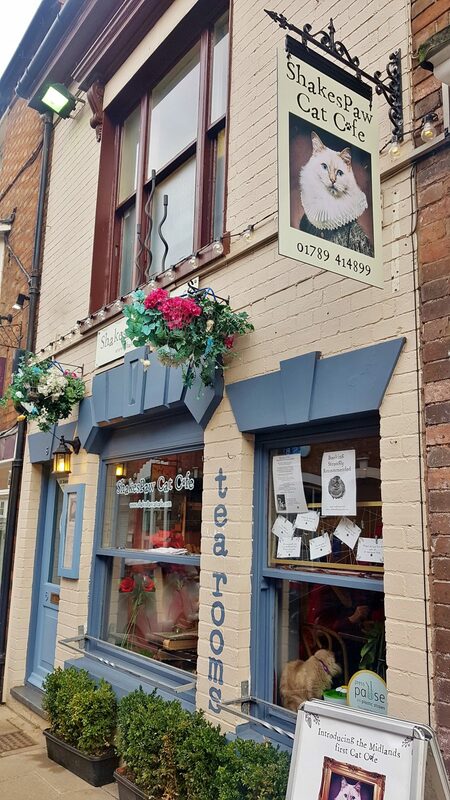 Shakespaw Cat Cafe is located in the heart of Stratford Upon Avon and it was really easy to find. Upon entering the cafe you have to ring a doorbell to be allowed entry – for the cats safety you can’t just wonder in and out. 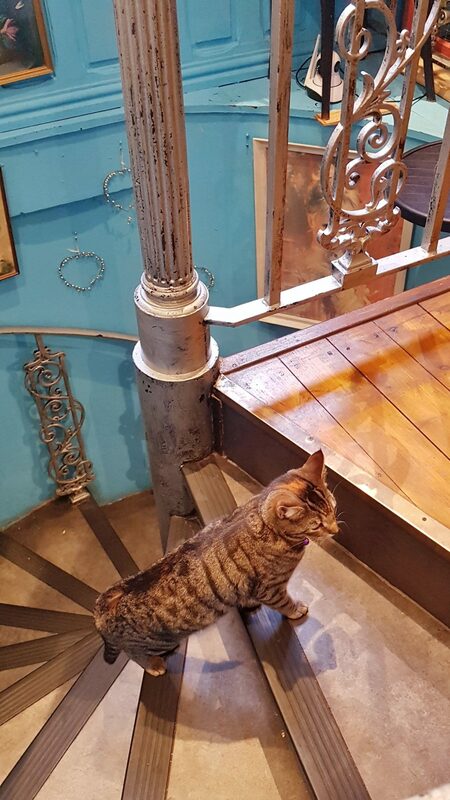 We were then allowed to choose where we wanted to sit, and I picked the table nearest to the staircase where we had a pretty good view of the cafe and all the kitties! A staff member ran through the house rules with us, which is basically don’t do anything that could upset the cats. This includes not waking them up, not picking them up, and not using flash on your camera. But you’re welcome to stroke the cats and walk around to see what they’re all up to! They also do not allow children under 10 or groups of over 6 people to visit to ensure a stress free environment. 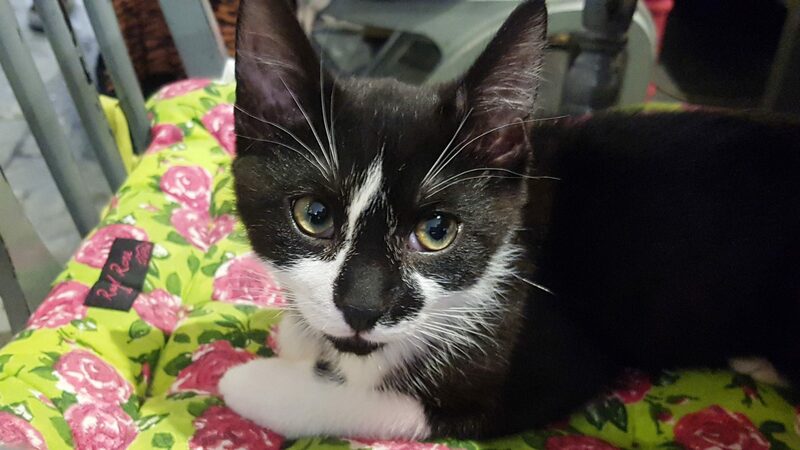 On the chair next to where we were sat was the tiniest little black and white kitty called Puck, who I believe is only 12 weeks old. He is so tiny and cute, and he was very happy to be stroked and fussed over! We then spotted three little white cats with blue eyes (Romeo, Juliet and Tybalt!) 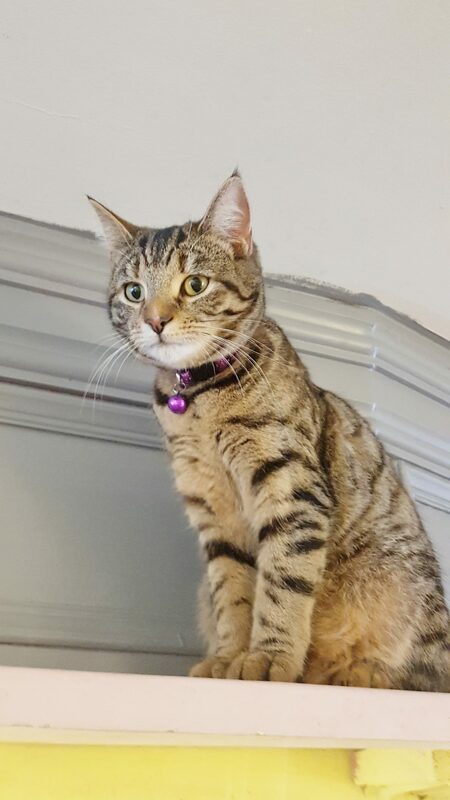 lounging around on one of the shelves. They were so cute and soft and they clearly all loved each other as they snuggled up together. 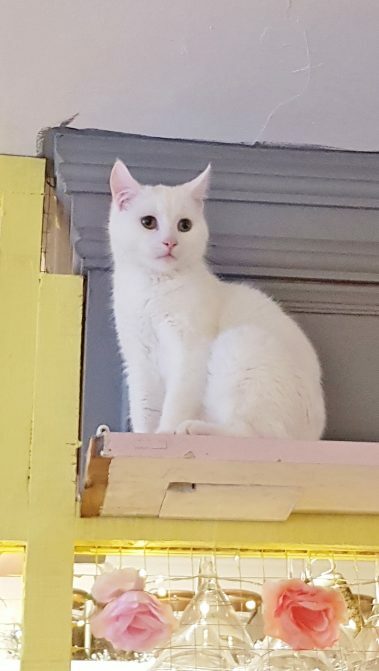 I loved that they seemed very comfortable roaming around the cafe, wandering up and down the staircase and coming up to visitors when they wanted some fuss. Even though there was secluded places where the cats could go to hide if they wanted to, they preferred being around people, which was lovely to see. ‘Bottom’ was definitely my favourite cat! 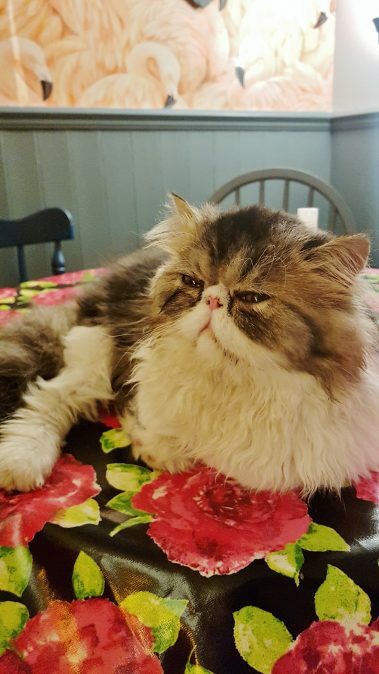 He’s a Persian cat with silky fur and a cute little squished face! 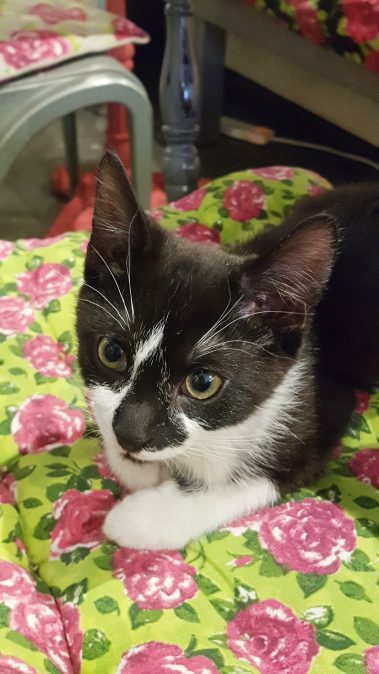 He absolutely loved attention and was a very playful cat. The tabby cat Viola was much more active and he could usually be found dashing around, although by the end of our visit he must have worn himself out as we found him curled up asleep downstairs! I loved the decor in Shakespaw Cat Cafe – it was kind of rustic and vintage tea room style with lots of places for the cats to snooze and relax. Although we were lucky when we arrived because it seemed like all the cats wanted to show off or come and say hello and be stroked. These cats love a bit of attention! Although we were sat upstairs you were encouraged to go downstairs to see the rest of the cafe and find the other cats. The cats had their little trays down there as well as a ‘secret’ cats only area where they could go for some peace and quiet. Although no cats were in there.. they’re clearly a sociable bunch! I loved the style of the whole cafe and downstairs was some more quirky furniture, nostalgic pictures on the wall and some funky flamingo wallpaper! 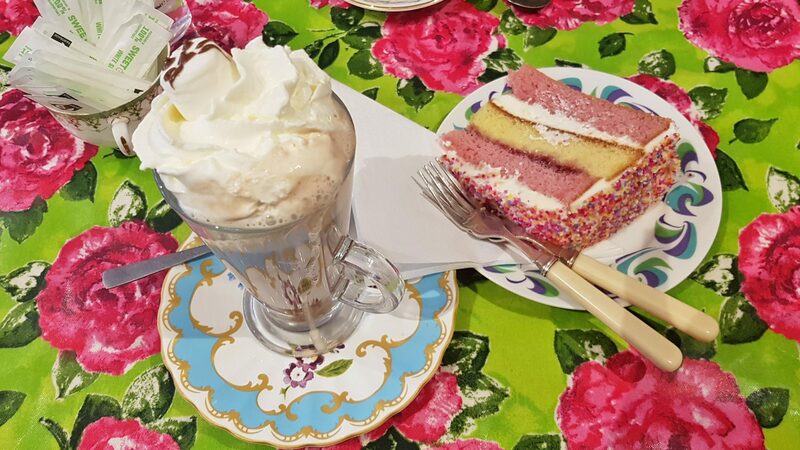 We ordered a couple of hot chocolates with cream and marshmallows (£3.50 each) and a slice of Angel Sparkle Cake (£4) to share. I love that they use mismatched vintage crockery and cutlery! The hot chocolate and cake were both very nice, but they also do sandwiches, scones and proper afternoon teas too. 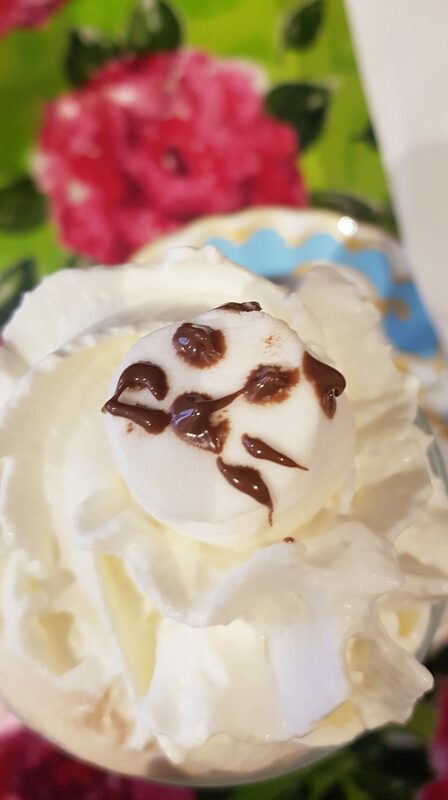 They even do prosecco and cocktails! I think we got to spend time with all of the cats except for their resident ragdoll cat Hermione, who was having a snooze by the front door and didn’t want to be disturbed. I have a ragdoll cat at home so I would have loved to have seen what her personality was like compared to my boy! But I guess I will just have to wait until my next visit and hope she’s awake next time! I also have my own Persian cat at home who was actually quite similar to Bottom.. an attention seeker! What I loved most about visiting Shakespaw Cat Cafe is how happy all of the cats clearly are and how much they seem to love each other too. Watching the cats interact with each other was so heart warming, and they were so comfortable around humans too that they would happily come and sit next to you without being scared. It was so nice to see so many sweet fluffy cats! 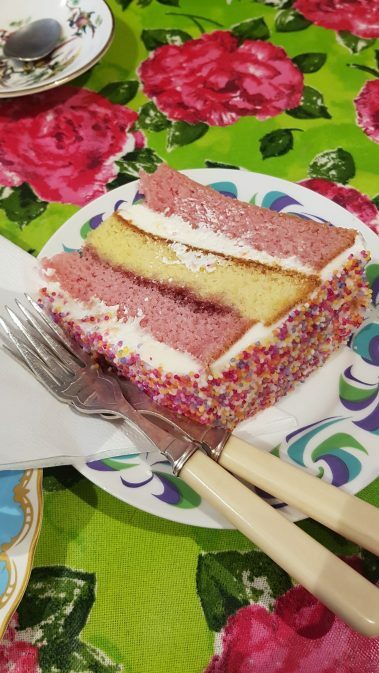 In total including the drinks and cake the visit cost us £21, which although may seem a little on the pricey side, this isn’t a normal cafe. 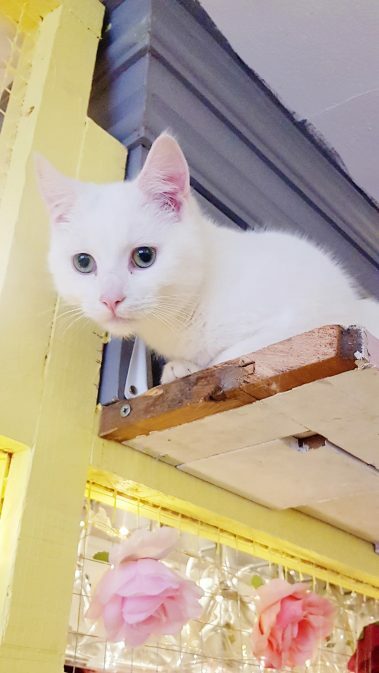 The money is used to take care of and feed the cats, and I certainly don’t mind paying a little bit extra to spend some time with these lovely kitties! 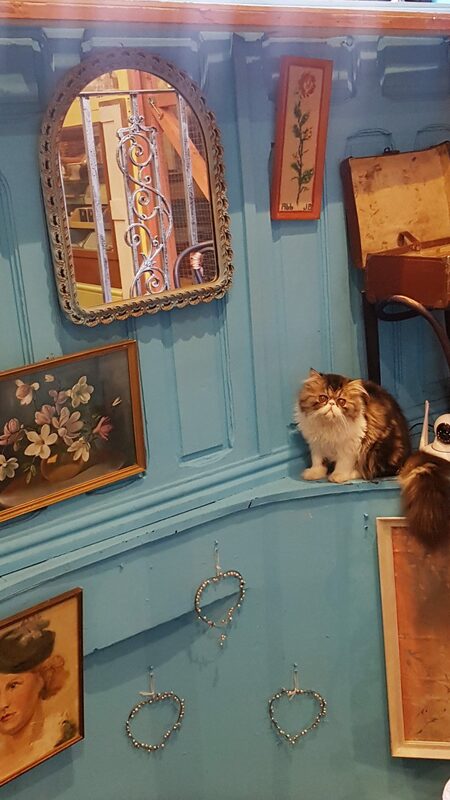 If you’re a cat lover then I definitely recommend paying Shakespaw Cat Cafe a visit! Also Stratford Upon Avon is a lovely little town to walk around, so it makes a great day out! I’m already planning another visit when the weather picks up. What a cute cafe! I love Cats… definitely need to visit one day. 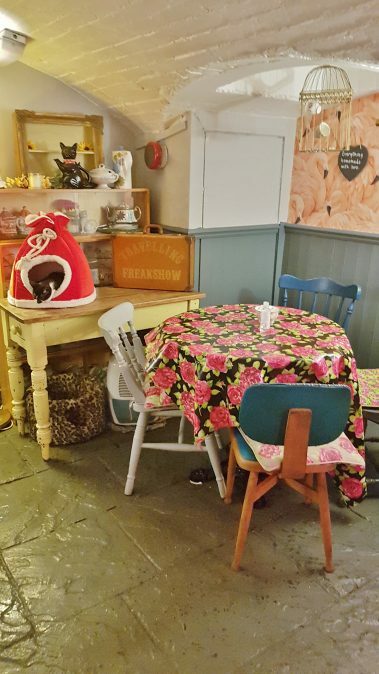 Aww this looks like the most adorable place to stop for some cake and a drink. 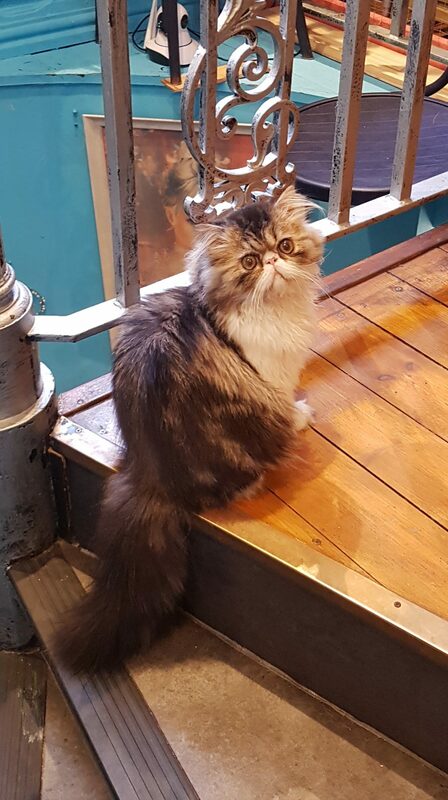 I’ve never made it to a cat cafe before but I would love to go to one sometime, I love the play on words with this one as well. I would love to go here but my boyfriend (stupid boy!) is allergic to cats – waaaah! 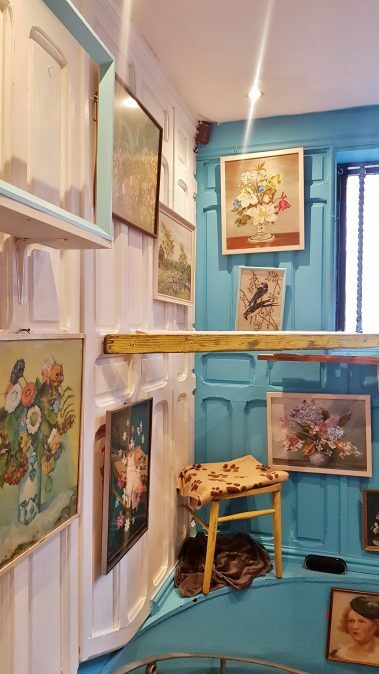 I love the quirky interior and all the little hidey holes and perches for the cats, it’s so cute. This looks like such a fab place! 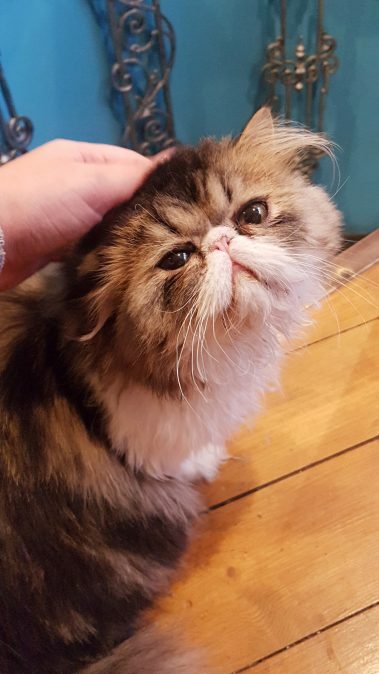 We aren’t allowed pets in our property and I love cats so I really should go and visit a cat cafe, they look great. I love Stratford and I’d love to go to a cat cafe so this looks perfect for me! This is like my dream! 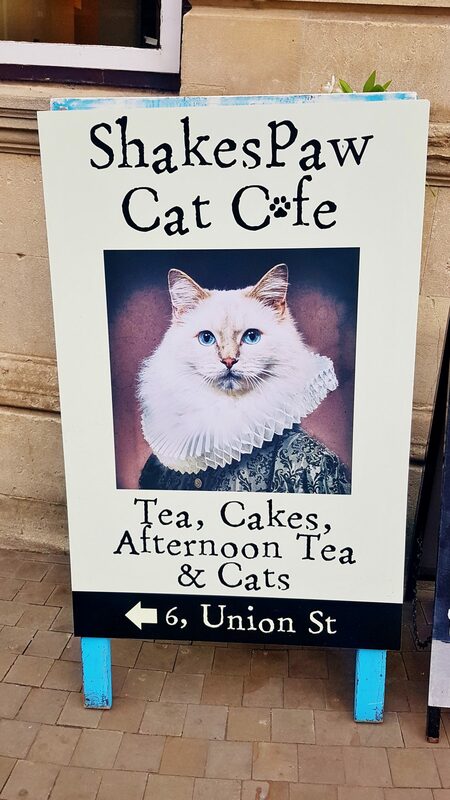 Cakes and cats! What more can you ask for?! Oh my goodness, I love the look of this (and the name!). My daughter is desperate for a cat so I’d love to taker her along!